DVI Cable Assembly for long-distance transmission – Shibata Co., Ltd.
30m transmission distance was achieved without external power supply by DVI cable for long-distance transmission. Adoption of new technology has enabled transmission of digital video interface (DVI) signals up to 30 meters with a metal cable, compare to the previous limitation of 5 meters. Compared to optical transmission systems, inexpensive pricing and simple setup by just one cable. * The cable has a transmission direction of signal. ○ No external power supply is required. - The connector has a built-in equalizer circuit, which make external power supply not required. - Transmission of maximum resolution is possible by single link. ○ Compliant with the VCCI (Japan), FCC (U.S.A.) and CE (EU) electromagnetic wave radiation standards. 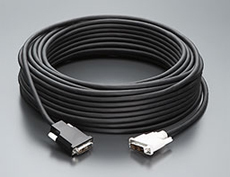 - DVI Cable Assembly is ideal for connections of TOTOKU medical display in clinical practice. ○ Simultaneous transmission of DDC signals. - External EDID setting not required.